Hannah’s House is a children’s respite centre, providing a “home away from home” for kids with life-limiting conditions and their families. It’s a safe, fun place where kids feel comfortable and are cared for, and where parents have the opportunity to take a break as primary carers for their kids. 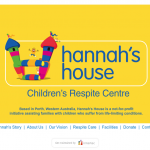 Intertec is proud to support Hannah’s House by providing web-site maintenance services. We’ll be looking after the Hannah’s House website, updating it with new visuals, stories and news. If you’d like to find out more about this very worthwhile organisation. Visit the Hannah’s House website.